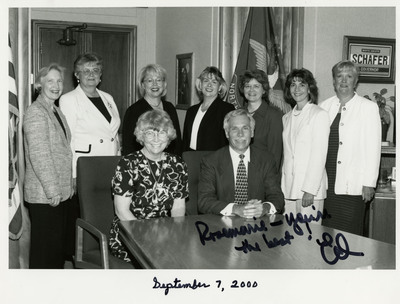 "Governor Schafer and Lieutenant Governor Myrdal"
Group photo of Lieutenant Governor Rosemarie Myrdal, Governor Ed Schafer, and seven unidentified women. Caption by Governor Schafer reads: "Rosemarie - you're the best! Ed"